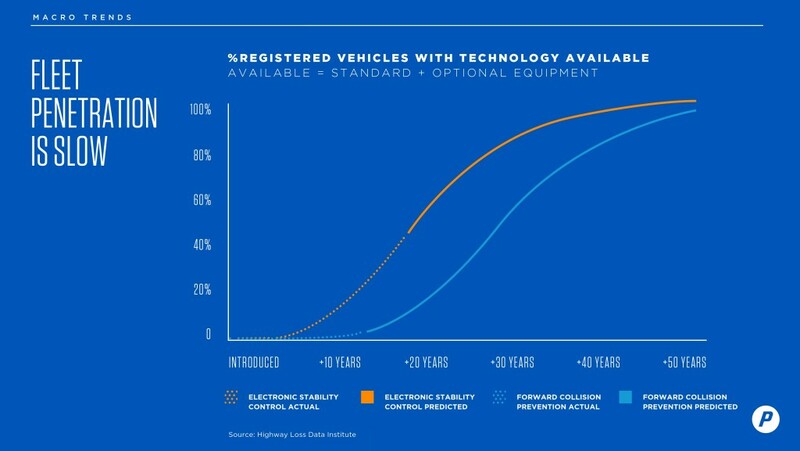 Data show automated car safety technology has already cut into collision claims volume but in some cases increased claim severity, Progressive’s chief financial officer said earlier this month in the latest — and perhaps the most telling — confirmation of the impact of the technology. Electronic stability control has existed for about 20 years and can be found in 50 percent of the fleet, Sauerland said, while forward collision warning only has penetrated about 5 percent of vehicles on the road during its decade of existence. Stability control has certainly reduced accidents, but Progressive drilled deeper, according to Sauerland. Now, the company is looking at factors such as whether a young driver in a SUV benefits more from stability control than an older one. “We want to lead in terms of pricing segmentation,” he said. Collision repairers are probably already aware of the impact of stability control, but what about the newer forward collision detection features — which can even advance on some models to automatic braking. “Early results are very promising,” Sauerland said. Accident frequency is “definitely” down with collision warning — and that data set included vehicles without the more advanced automatic braking — but severity has risen. That trend has been observed in other studies, most recently in Thatcham’s United Kingdom analysis, but the kind of aggressive number crunching Sauerland described at the nation’s No. 4 insurance company should make collision repairers really take note. And severity — which at least raises the invoice price on the crashes that still will grace your shop — might be reduced by different engineering. But the overall impact still appears to threaten the collision repair business of the future. “Net, however, we’re seeing lower loss ratios,” Sauerland said.